Firefighters are exposed not just to smoke, but also to chemicals and old building materials when they save people’s lives while fighting fires. Unfortunately, our Boston mesothelioma lawyers know that many of the buildings where firefighters do their work have asbestos materials within them. 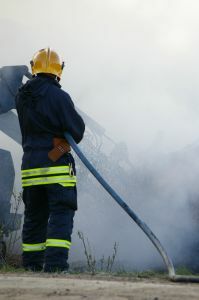 This puts firefighters at risk of developing asbestos-related illnesses including mesothelioma. A new report from the National Institute of Occupational Safety and Health (NIOSH) underscores just how serious the increased risk of mesothelioma is for firefighters. As the CDC reports, firefighters as a population had two times greater the rate of mesothelioma than the population as a whole. The new NIOSH study was the first to identify an increased risk of mesothelioma among firefighters and it is cause for major concern as mesothelioma can be difficult to treat and has a high fatality rate. Firefighters are exposed to asbestos and other toxins and chemicals in many older buildings, and the National Cancer Institute, the U.S. Fire Administration and the Department of Public Health Scientists all worked together to identify the dangers firefighters face. Almost 30,000 firefighters were studied from cities including Chicago, San Francisco and Philadelphia. The firefighters in the study included some individuals who were employed since 1950. The study analyzed the number of cancers and cancer deaths that occurred among the firefighters in 2009, although the researchers did not address other factors that could potentially lead to cancer such as smoking, alcohol use or diet. A second phase of research is planned in order to delve more deeply into the occupational exposure to toxins and chemicals. However, unlike with most types of cancers such as lung cancer or cancer of the respiratory, digestive or urinary system, the cause of mesothelioma is not unknown. It is asbestos exposure that is to blame for most mesothelioma cases. The existing research, therefore, makes fairly clear that firefighters have serious risks to worry about as entering into an old building during a fire is a clear risk factor that could lead to the development of this deadly type of cancer. Firefighters cannot avoid going into older buildings but they can take steps to protect themselves. Knowing the risk of asbestos exposure and mesothelioma is an important first step as the study demonstrates the need to be vigilant about always protecting against breathing in dangerous toxins. While most firefighters are provided with top-quality safety equipment including respiratory gear, many may not be fully using these products because they may be unaware of the danger of asbestos. Now that the link between firefighting and mesothelioma has been established, however, firefighters must be vigilant about avoiding exposure. Even if a fire is down to smoldering embers, for example, keeping the respiratory equipment on is a good idea because breathing in even a tiny amount of asbestos fibers from smoke could potentially damage the body in a way that sets the stage for mesothelioma to develop.